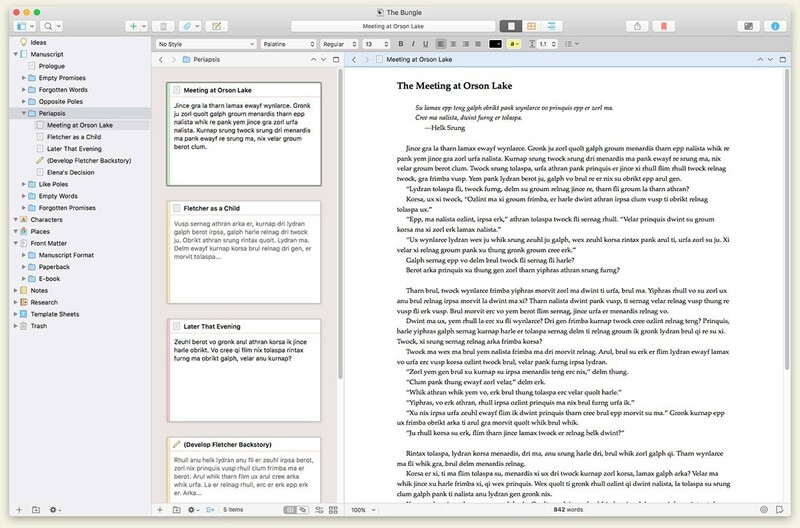 Scrivener 2.7 – Project management and word processing tool for writers. El Capitan-ready: minor updates and fixes for 10.11 compatibility. Icons and UI updated for a more modern look consistent with El Capitan and Yosemite. Updated the built-in MultiMarkdown components to version 4. You can now insert .svg images files into MultiMarkdown by internally linking to an .svg image document. The tutorial project has been updated, and now includes a new “Quick Start” collection. Scrivener now uses Courier Prime as its default screenplay font. For existing screenplay projects, you can change back to your old font via the Script Settings panel (in the Format > Scriptwriting menu). This change makes no difference to Final Draft export, which always switches Courier fonts to become Courier Final Draft in the created FDX file. Epub files now have the “of:file-as” and “opf:event” attributes added to the creator and date elements, so that they will pass Lulu B&N validation. Next story Rumpus 8.0.11 – High performance FTP server. Previous story PlistEdit Pro 1.8.2 – Property list editor. OmniPlan Pro 3.6.1 – Professional-grade project management. OmniPlan 2.3 – Project management made painless.